Gypsum grinding is the required process for further processing of gypsum, and it is a powdering or pulverizing process. SBM designs and manufactures a comprehensive line of grinding equipment as mills, classifiers, and related accessories for both wet and dry grinding systems. We offer a complete spectrum of engineering services, including testing, process design, installation, commissioning, start-up, maintenance and continuous lifetime product support services. For best gypsum grinding, SBM supplies ball mills, vertical mills, MTM trapezium grinding mills and MXB coarse powder grinding mills used for primary for single stage fine grinding, regrinding, and as the second stage in two stage grinding circuits. SBM has started gypsum processing plant in Pakistan, USA, Canada, Iran, Spain, UK, France, India. These gypsum mines deposits go through crushing, grinding process to make gypsum into powder. 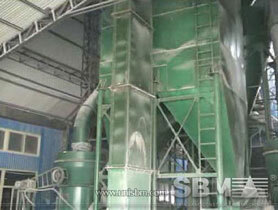 SBM can design gypsum powder production process with different grinding mills. "SBM supplies the right gypsum grinding mills and grinding solutions to every method and application."